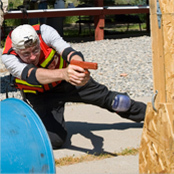 Choosing the right Firearms Training Instructor for your CCW, CFP permit or Tactical Training needs is critical. Here's why you should choose Self-Defense Solutions for your Handgun Familiarity, Firearm Safety and Tactical Training needs. Recommendations for any business are very important. Company hype is everywhere on the Internet. The best way to measure the service or product that really gets delivered to a prospective client is to ask those who have already attended our CFP class. The Utah Department of Public Safety has also recognized Welden Andersen of SDS for the many favorable responses to their survey about his CFP classes. They also thanked him for his professionalism, dedication and knowledge conveyed to his students as a firearm instructor. When students and the governing body for Firearm Permits put their own reputation on the line for your services it carries a lot of weight. Now you'll know WHY these students chose SDS for their CFP class and WHY you should too. Can't even begin to tell you how much Darci enjoyed your course on Saturday. Thanks for running such a top-notch program. Thanks for teaching a great class. I learned so much from your insight, experience, wisdom, and knowledge of law. Your teaching skills put you among the best of anyone who has given me firearms instruction, even among law enforcement trainers. I also appreciate your animated and passionate method of teaching. Your stories and examples helped me understand the principles you taught. Even after 24 years as a police officer, I knew I would learn a lot from you. I highly recommend your class to any who are interested in obtaining a concealed carry permit. From the novice shooter to the seasoned firearms handler, all can greatly benefit from your class. I know of no other class that gives so much for the nominal fees you charge. You've now trained three of my children, all of whom are concealed permit holders. I'll bring my youngest one next year! Thank you for the outstanding instruction that I received while attending your course on Saturday. It was so much more than I expected. Syllabus, enthusiastic presentation, knowledgeable, accurate and up-to-date information on the law and practical application was excellent. I also appreciate the fact that you put your money where your mouth is and keep updated by attending the continuing education that hones your skills. You just can't fake something so important. I also appreciate your service to our country as a United States Marine. As you may have guessed, at one time in my life I had a lot of experience with small arms, and spent thousands of hours on the rifle range poking holes in paper. I also taught school for many years. Let me assure you that your class is so close to perfect that even I can't offer any suggestions. You don't need to change a thing. Everything is just right. Don't mess with perfection, you can only harm it. Your fees are very reasonable. If you find more signing up than you care to teach, just raise your prices a little. I also think you are a Teacher, not an Instructor. The difference is that the Instructor tosses out the slop in the trough and if the little piggies get some, okay, if they don't, tough. You actually care that everybody gets some and go out of your way to find alternate explanations till they all comprehend. Keep up the good work. I just wanted to say thank you again for all the information you gave us on Saturday. I really feel like I grew a lot. I sure am a lot more aware of my surroundings! I have been reading over and over the information you gave me. I am going through scenarios in my dreams!!! I turned in my application this morning. .... They told me it would be 60 days. Hopefully I get it sooner! I can't wait! Again, thank you so much for taking the time you do with the classes you have. I will be HIGHLY recommending everyone I know to go see you for their classes. It really is important to know as much as you can in that class. Have a wonderful day, I hope to see you again soon. I'll be practicing often!! Your class covered much additional information including basic firearm training from an expert, which I believe is important to someone obtaining a concealed firearms permit. In my class I was taught the responsibility of carrying a firearm, but in your class I gained significant additional insight and actually felt the weight of the responsibility and the need for additional training. Your class was obviously longer but the information that was taught was very helpful even for someone who has completed another CFP course already. The video discussion was very good. I think that it started a very interesting dialog that would have been missed otherwise. As we saw it required the students to think about different scenarios that created some curious responses. The text portion of the class was similar (no surprise) since this is the required items. But the fact that you had several different types of hand guns and bullets that you passed around gave the students the ability to touch the deferent styles instead of just looking. Another section that was explained in more depth and better was the carrying positions and the types of Holsters. My instructor touched on this but really I learned from my friends and for myself just messing around. The amount of time that was spent on the types of clothing that would be recommended to wear with a firearm was not even mentioned in my course. This was a huge difference that I saw because I had to learn this on my own. I knew that my choice of clothing would change but did not realize that it would impact me as much as it has. For my wife and I the hands on training with our firearms was vastly superior. I am sure that my instructor is more than capable but he really did not show to me that he was all that concerned. This is a big reason that I did not use this instructor for my wives training. I could go on all day about how much I liked your shooting portion. In fact I have told all of my friends about how much fun I had (Tons). Many of who said that they would love to do this type of shooting. The metal targets were awesome, I felt like I was getting the same (better) training that my friends who are in law enforcement received when they first started. The different scenarios that we went through were just awesome, I really can't explain how much better training my wife received with these scenarios compared to what I received when I went through this portion of my training. Really my wife and I walked away from your class very happy with what was taught. The classroom portion was really good and the information was good but the shooting was Great!!!!! I have never had that much fun shooting my gun. I think that I will be missing a few more Saturday's at work. That was just too much fun not to do more of. Before your CFP class, I was against carrying guns. I didn't want to go camping anymore with my husband if he carried a gun. But recent animal attacks on people made me realize that we did need protection, and it was obvious if he got attacked, I'd need to be able to protect him. So I decided to attend your class with him. My first surprise was seeing others at the class. Not anyone there was a "gun-toting redneck." All of them were business owners or other regular people, and several women were also there. I actually enjoyed the class. You were entertaining and also knowledgeable. You were thorough and more than thoughtful. Quite simply, I have changed my mind. I think people should be able to carry a gun if they are trained and they feel they need one. I wanted to email you to let you know how glad I am that I decided to attend your CCW class. For the first time I feel confident enough to carry a handgun to protect myself, my family and others; if necessary. Let me elaborate. Almost eight years ago my wife and I had a very terrifying experience with a peeping tom at our apartment in the avenues. I will spare the lengthy explanation except to state that I really felt that my wife or I could possibly find ourselves in a situation that would necessitate the need for protection. Shortly after the first incident and a handful of others including the unknown man I decided to take a CCW class offered during the gun show at that time. It all sounded fairly straightforward so I paid my money and attended the class. After a long, boring, uninformative few hours I was getting my picture taken and having fingerprints made. We didn't handle or discuss varieties of guns or ammunition (we may have looked at a plastic representation of a revolver and a semi-auto pistol), have any hands-on demonstrations, discussion as to why or when to use deadly force, what to do afterword, how to aim, shoot, carry a weapon ... the list goes on and on - this list however could only be mentally created once I attended your course. After I received my CCW I did not carry more than two times in a 5 year period as I didn't feel I had never really received the initial training necessary to have a firearm on my person. Having let my permit lapse a few years ago, I felt it was time to give it another go. After attending your class I feel that I have enough knowledge of the fundamentals and a basic practical skill set that I can confidently carry a concealed weapon for protection. I was thoroughly impressed with your credentials, knowledge of the law, knowledge of guns in general, situational awareness, enthusiasm for the subject matter, appropriate sense of humor and above all your attitude of encouragement and expression of the need to practice often (this should seem like common sense - but your class truly helped me see the importance of this). Your course truly prepares one to carry a weapon because you take the time to show someone how shoot a handgun (which should be required, in my opinion) in a very controlled and comfortable environment. Also, you provide opportunity for your attendees to increase their skill set by inviting them to participate in the Polite Society. I know that your course is not the end of the road for your students as you demonstrate a vested interest in helping us be safe and prepared. This will be my second CCW in ten years and the first time I feel confident to carry. I appreciate your efforts in making your knowledge and skills available by teaching your course. Feel free to post any or all of this on your website or printed material as I hope it will encourage others to take your course instead of wasting time and money on some other bare bones approach to this very important subject matter. Thank you again for the very insightful class, I look forward to associating with you more in the near future. Thanks Welden , The class was very informative, I learned a ton. Thanks for the opportunity to attend your CCW class today. As you know, instructor quality makes or breaks any training. You get a Gold Star. Well done, sir. Well done. I appreciated the day on Saturday. I got my permit 6 years ago and always had a vague feeling of unease in actually carrying. I felt that the course was inadequate that I originally sponsored and attended. My husband (A Lt Col in the US Army and Apache Pilot) and I sponsored the class for our employees, spouses and adult children and extended the invitation to people important in our lives. 16 people attended. At one point guns were passed around and after 10 or 12 people handled the gun, my brother discovered that it had a bullet in the chamber. The instructor was embarrassed but tried to play it down. Very little was discussed about the law and effects of a CCW permit. There was no safety training whatsoever. It was as if he assumed everyone had grown up with guns in their hands. I was very impressed with your course because you taught as if everyone was new to gun exposure, but you didn't talk down to anyone. Several of the men commented to me that even though they were novices they felt that they understood guns much more after your class. Your handouts were exceptional and your manner very professional, but approachable. I would (and already have) recommend your course to anyone interested in family preparedness. I believe that if we educate ourselves and then practice the skills we can be much more effective in protecting our families. Feel free to use me as a reference at any time. I attended your last class with my daughter. We both really enjoyed the class very much and learned a lot about when and where it is legal to use our guns. Thanks again for all your wisdom. We will certainly send all our friend's business your way. I heard about you from my brother. He apparently took your course and has had nothing to say but good things. I was looking at another one that was recommended by one of my nurses. However, Brad told me about the quality you provide and so I have signed up. I am also trying to talk my brother-in-law into registering for that day as well. So, I will try to drum up some more business for you. Thanks! I liked the hands-on hold & touch guns and felt comfortable asking questions. I feel more informed & less fearful of owning a gun. I like that there were past participants in the class and I felt like you have a healthy attitude about guns without a rambo type attitude. I would definitely recommend this class to others. Thanks again for your well-presented and very informative class last Saturday. I enjoyed it very much and I was impressed with your presentation skills. The class was both informative and entertaining. As you pointed out, the gun is only a tool. Further and continuing practice and education is essential to the ability to defend ones self with better odds of survival. Again, thanks for the class. I think I'll ask my wife or daughter to come up and take the class. Truthfully, your class was one of the best classes I've taken on any subject. Going to the range was fun but I could have done a few more hours in your class. Thank you. You too can have similar experiences by joining us in a Firearm Training class.